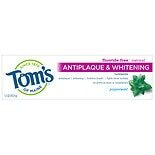 Shop Tom's of Maine Antiplaque & Whitening Toothpaste Peppermint (5.5 oz. )5.5 oz. $649$6 and 49 cents$1.18 / oz. Shop Tom's of Maine Children's Gel Toothpaste Fruitilicious (4.2 oz. )4.2 oz. $449$4 and 49 cents$1.07 / oz. Shop Tom's of Maine Children's Natural Fluoride Toothpaste Strawberry (4.2 oz. )4.2 oz. 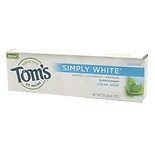 Shop Tom's of Maine Simply White Natural Fluoride Toothpaste Clean Mint (4.7 oz. )4.7 oz. $649$6 and 49 cents$1.38 / oz. $699$6 and 99 cents$3.99 / oz. Shop Tom's of Maine Wicked Fresh Fluoride Toothpaste Cool Peppermint (4.7 oz. )4.7 oz. 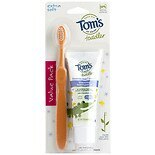 Shop Tom's of Maine Natural Fluoride Free Toothpaste for Children Silly Strawberry (4.2 oz. )4.2 oz. Shop Tom's of Maine Rapid Relief Sensitive Fluoride-Free Natural Toothpaste Fresh Mint (4 oz. )4 oz. $649$6 and 49 cents$1.62 / oz.